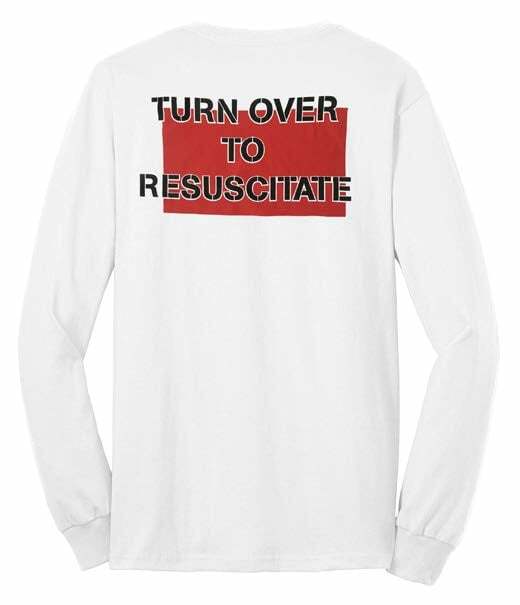 Our AED/CPR Long Sleeve T-shirt is a humorous, instructional, AED and CPR lifeguard shirt. Includes phrases like "Turn Over to Resuscitate", "IV access", "Compress Here", and more. White 100% cotton long sleeve AED/CPR T-shirt. Humorous, instructional First Responder design. AED/CPR "road map" on front, "Turn Over to Resuscitate" on back.